As a licensed esthetician, and with experience in traditional tattooing, Susan Prince is eminently qualified to provide permanent cosmetic services. She is a graduate of the International Dermal Institute in a course of study affiliated with the Scot Lewis School in Bloomington, Minnesota, where she completed an intensive program leading to licensure as an esthetician in the State of Minnesota. 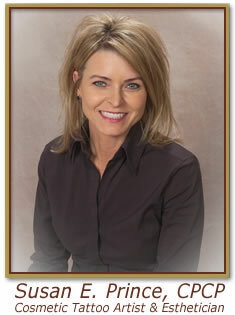 She is also a Certified Permanent Cosmetic Professional (CPCP) and is BloodBorne Pathogen Certified. She was a substitute supervisor in the Esthiology Department at the Scot Lewis School where she oversaw students on the clinic floor. Her credentials are enhanced by significant experience in traditional tattooing and, as a result, her knowledge of skin pigmentation and its applications is unparalleled. In addition to her initial training, she has accumulated hundreds of hours of advanced training in state-of-the-art techniques and procedures for permanent cosmetic application at seminars and other industry events. Susan Prince has treated many with these beautifying and enhancing procedures and clients overwhelmingly report that they are most pleased with the results. Since its inception, clients have been so happy with their permanent make-up, that they began referring their friends and relatives to the Center, and business has expanded and continues to grow, chiefly by word-of-mouth from client to client.